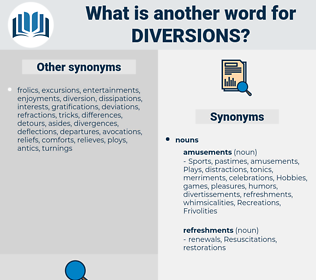 What is another word for diversions? organization, organizes, arrangement, arrangements, Organizing, organize, arranging, arrange, placement, CEPA, schedule, PAI. 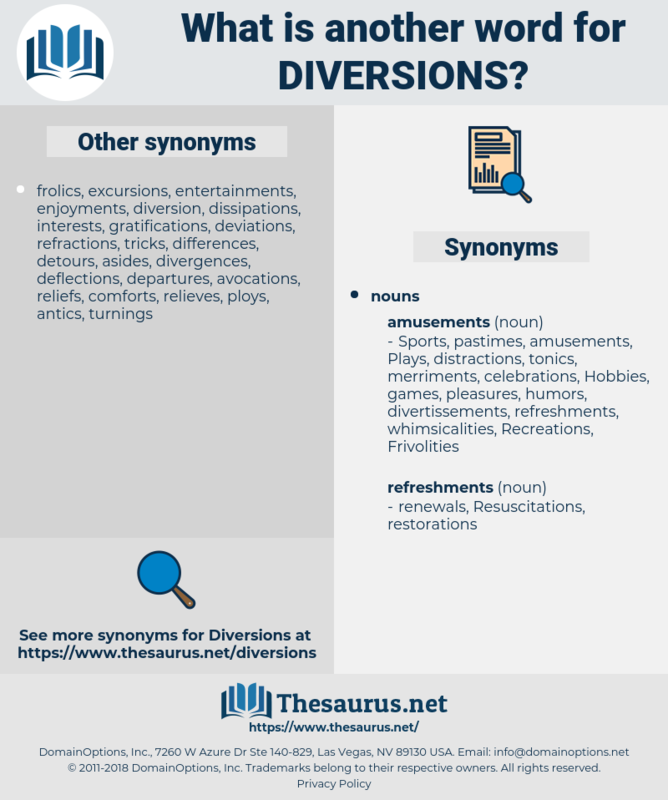 divisions, distortions, conversions, precautions, aberrations, divergences, routings, allocations, redeployments, re-allocations, fluctuations, reassignments, Remittances, Routing, routes, carjackings, Irregularities, leaks, errors, Tendencies, recoveries, Measures, Traps, shifts, Anomalies, hijacks, placements, Schedules, Biases, leads, drifts, shunts, organizes, LINEs, arrangements. misappropriations, reallocations, derivations, re-routings, detours, transfers, variances, departures, alignments, abuses, excesses, hijackings. For two days he refused to join in the hunting or diversions of his companions. To him, it was only a substantial box, variation in size and in exterior finish being the only possible diversions from the original type. deaf person, Douay Version, depression, dead person, diaphragm.